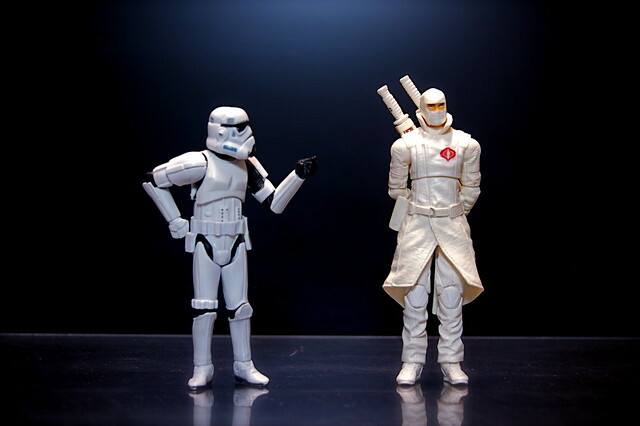 Stormtrooper vs. Storm Shadow (1/365) | Flickr - Photo Sharing! Look at how cool Storm Shadow is! Stormtrooper: Emperor Palpatine's foot soldier. Storm Shadow: Cobra Commander's ninja assassin. If they had to fight, who would win? #1 in the Duel 365 series. willycoolpics., Leslie Hancock, and 70 other people added this photo to their favorites. Soft spot for ninjas here. duel 365?! holy cow, this is going to be epic, I can tell already..
Ninja ftw, each and every time.. Unless it's Afro Ninja. Ha! One more vote for Stormshadow! Strom shadow. Stormtroopers are the galaxies worst warriors ever. I'd have to go with the Storm Shadow, the troopers aren't the sharpest tool in the shed! Storm Shadow easily. Ever since Obi-Wan said 'Only Imperial Stormtroopers are this precise' in the first movie he must have jinxed them or something cos after that they don't hit a single thing they aim for. My brain is with Storm Shadow... but may heart will be always with the trooper! I will vote for the trooper!